Many years ago, my father and I worked on a Nautilus from Comet, it was about the same scale but vacu-formed with white metal details. This model turned out fairly nicely. 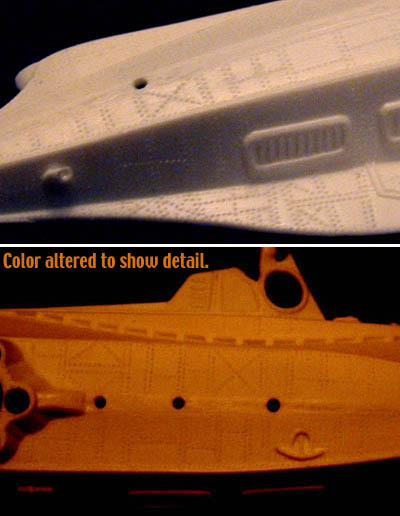 This resin kit is much nicer for one major reason: rivets. 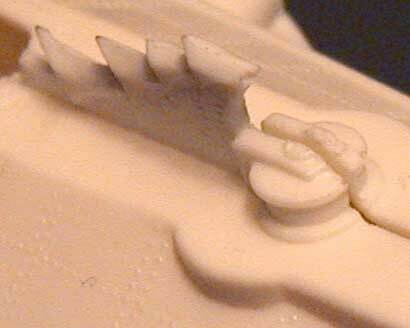 All up and down the sides of the Nautilus are the exposed rivets which hold on the submarine's armor plating. This is the first model I have seen at this scale that includes this one critical detail. Fortunately, all of the inaccuracies on this model, as far as I can tell, are on the box. 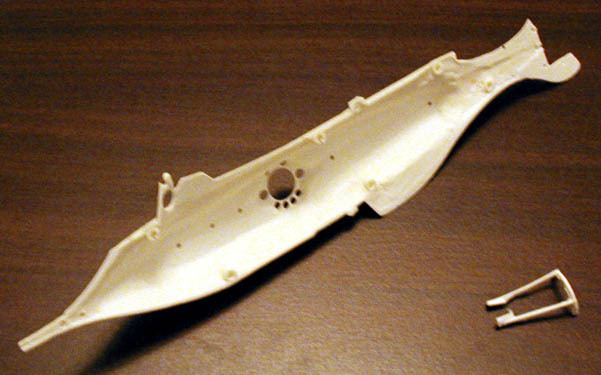 The box indicates the model to be 12" long, and 1/350 scale. 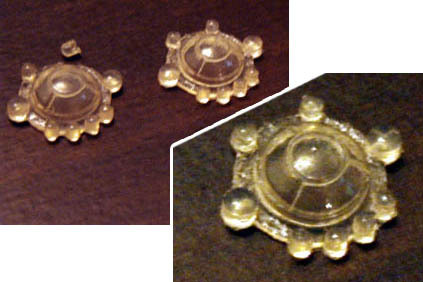 The finished model is actually about 10 and 1/2 inches, as indicated above, and 1/258 scale. I figured out the correct scale by measuring the model and finding the length of the ship in the original Jules Verne text. According to the book the ship is 70 meters long, or 76.5 yards. By the box's measurements, Captain Nemo's ship is 106 meters, or 116 yds, a significantly bigger boat. The box also indicates that the model has a production run on only 250. According to Federation Models whom I emailed this is also not true. 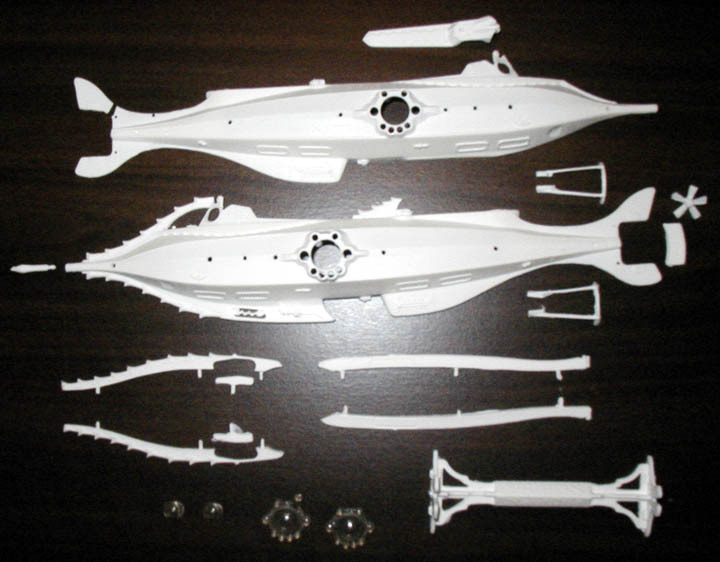 The major parts of the kit are the left and right hand hulls. These two pieces are hollow, and therefore not thick or heavy. Only the clear window pieces go on the inside, and everything else is an outside accessory. Test fitting the windows reveals some problems. Getting the side observation ports to go in nicely will require some TLC and flash removal. Most of the parts are very clean and nice, but without a doubt the biggest problem with this kit are the air bubbles which formed in the tips of the ramming barbs. 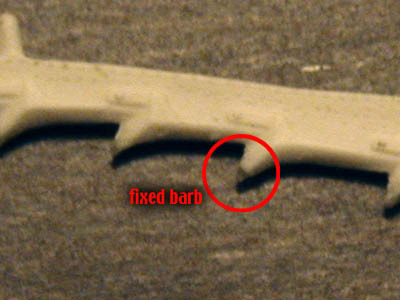 The barbs molded to the hull of the ship were fine, but the barbs on the left and right hand side which are separate parts from the hull had air bubbles in the tips. This is a terrible place for air bubbles. I fixed the problem to my satisfaction using multiple applications of thick Insta-Cure, a cyanoacrylate glue, over the holes, and shaping them after it set. The only other complaint I have with the kit is in the detail. One of the instruction pages shows detailed drawings of the hatches and deck cleats. The drawings exist, I think, for the super detailer who intends to remove the molded hatches and replace them with new and improved ones. As they are, the hatches are cut in half, each because they are molded to the main hull right where the 2 halves divide. I would like to have seen separate parts for the hatches. The deck cleats I can handle on my own with no problem. The instructions only tell (not show) how to assemble the kit, but there are plenty of schematics and diagrams included so it's easy to figure out. Painting for the model is vague and simple, but that is also not a problem -- since when was the last time any of us paid attention to the painting instructions that came with the kit? You're better off using the movie and studio model pictures as reference if you have access to such. Of course it is always easier to complain than praise. Except for what I have mentioned the kit is very nice. There is great detail, and it is very sharp. I was very impressed when I saw the rivets, and if I can keep from breaking the delicate propeller guard while I de-flash it it should turn out very nice. 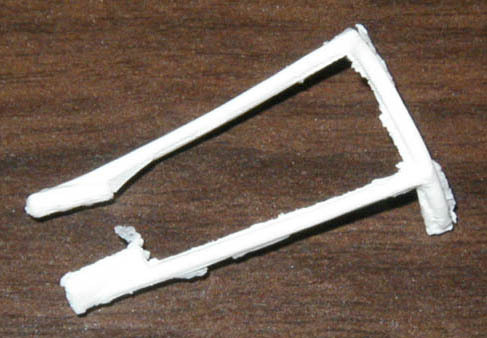 Like most resin kits, it is expensive, but like most resin kits, it's this or nothing. 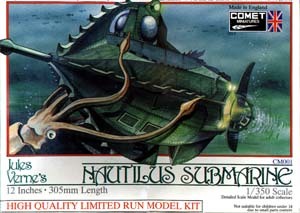 I recommend this model to anyone looking for a good Nautilus. For experienced builders, who fill seams, de-flash, and know resin. Many thanks to Kit's wallet for providing the review sample. Manufacturers and retailers, interested in getting your wares reviewed and publicized on a site averaging 2000+ readers a day? Contact us! This page copyright © 2002 Starship Modeler. Last updated on 10 July 2002.